In this photo, TLCBD removes graffiti from a construction barricade. 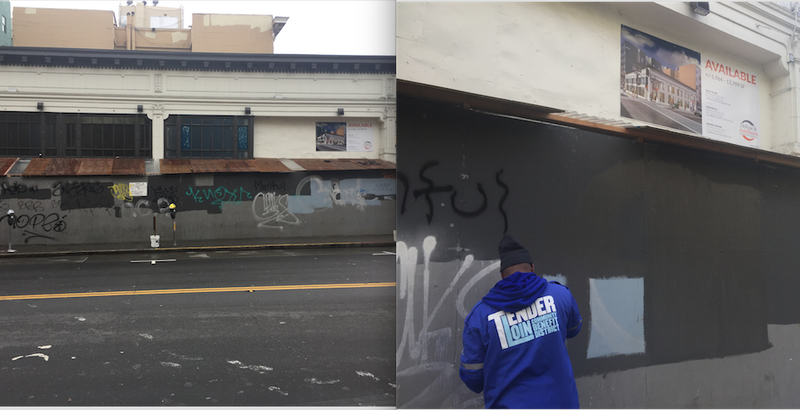 The property owners of 479-499 Ellis Street provided paint and the TLCBD graffiti release form allowing TLCBD to remove graffiti from the property after it occurs. Property owners, be proactive like 479 Ellis and help us keep the Tenderloin clean. Failure to remove graffiti from your building can result in a fine. In the month of December, Clean Team responded to 65 hotline calls. Call the Clean Team at 415-385-5490. Or send us a clean request online. · Collected 851 bags of trash 28,525 totaling lbs.